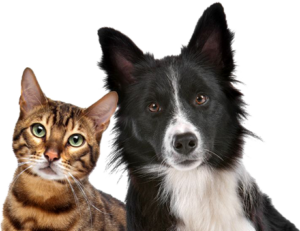 Do you have a pet door that can let the dog out but keep the cats in? No door can guarantee a cat can’t get out with the dog; the cat waits for the dog to go through. Even if you have an electronic door that requires a collar key, a cat may run outside when the dog opens the door. Cats are smart and quick and will run in front of the dog, under the dog, or behind the dog. We have even seen photos of cats running under the belly of a dog using an electronic pet door. One solution could be putting the dog door in a room with just one entrance from the main house. At the entrance of this room, put an indoor electronic cat fence. Pet Stop and DogWatch make these types of systems.